Peeli Kaner (Thevetia peruviana) complete detail. Medicinal uses of Peeli Kaner (Thevetia peruviana). Description of Peeli Kaner (Thevetia peruviana). Classification of Peeli Kaner (Thevetia peruviana). Thevetia peruviana is an evergreen tropical shrub or small tree that bears yellow or orange-yellow, trumpet like flowers and its fruit is deep red/black in color encasing a large seed. It contains a milky sap. Propagate by seed in spring. Can also propagate from cuttings in spring-early summer with hardwood cuttings. These plants are toxic to most vertebrates as they contain cardiac glycosides. Many cases of intentional and accidental poisoning of humans are known. A few bird species are however known to feed on them without any ill effect. The toxins are cardenolides called Thevetin A and Thevetin B (Cerebroside), others include peruvoside, neriifolin, thevetoxin and ruvoside. They produce gastric and cardio toxic effects…………..
A bark or leaf decoction is taken to loosen the bowels, as an emetic, and is said to be an effective cure for intermittent fevers. Local name of Thevetia peruviana is Peeli Kaner. Distribution of Thevetia peruviana. The plants have been used to treat heart failure in China and Russia for decades, but scientific evidence supporting use is limited to small, poorly designed studies. 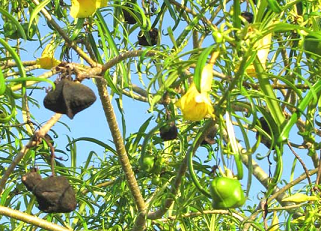 Thevetia peruviana is an evergreen tropical shrub or small tree that bears yellow or orange-yellow, trumpet like flowers and its fruit is deep red/black in color encasing a large seed. 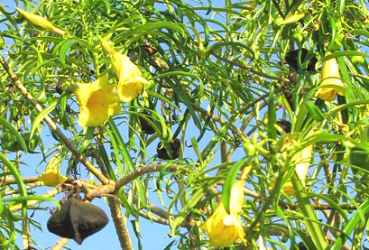 It contains a milky sap containing a compound called thevetin that is used as a heart stimulant but in its natural form is extremely poisonous, as are all parts of the plants, especially the seeds. 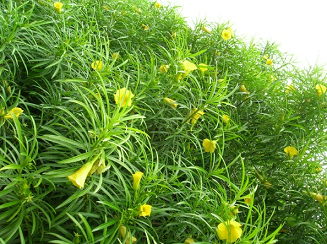 Its leaves are long, lance shaped and green in color. Leaves are covered in waxy coating to reduce water loss. Its stem is green turning silver/gray as it ages. Can be grown as shrub or tree outside in warmer climates. Will tolerate most kinds of soil as long as they are well drained and is situated in full sun in a sheltered area. Useful as a landscaping plant in warmer climates as it does not need much maintenance. Propagate by seed in spring. Can also propagate from cuttings in spring-early summer with hardwood cuttings. These plants are toxic to most vertebrates as they contain cardiac glycosides. Many cases of intentional and accidental poisoning of humans are known. A few bird species are however known to feed on them without any ill effect. The toxins are cardenolides called Thevetin A and Thevetin B (Cerebroside), others include peruvoside, neriifolin, thevetoxin and ruvoside. They produce gastric and cardio toxic effects. Antidotes for treatment include atropine and Digoxin antibodies and treatment may include oral administration of activate charcoal. These toxins have also been experimented for use in pest control. This plant is native of Central & South America, but now frequently grown throughout the tropical and sub- tropical regions. Thevetia peruviana originates from tropical America and is widely cultivated throughout the tropics as an ornamental, also in tropical Africa. 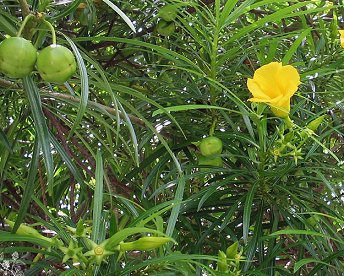 The term “oleander” refers to two plants, Nerium oleander (common oleander) and Thevetia peruviana (yellow oleander). Both plants contain heart-active “cardiac glycoside” chemicals (similar to the prescription drug digoxin), and have been associated with serious side effects in humans, including death. 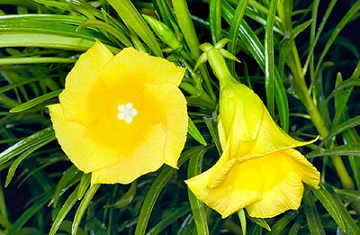 Thevetia peruviana is used medicinally throughout the tropics in spite of its toxicity. A bark or leaf decoction is taken to loosen the bowels, as an emetic, and is said to be an effective cure for intermittent fevers. In Senegal water in which leaves and bark were macerated is taken to cure amenorrhea. 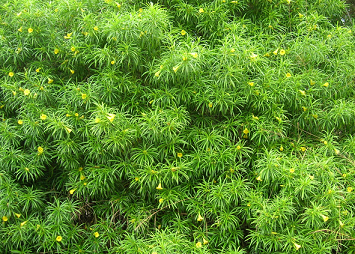 The plants have been used to treat heart failure in China and Russia for decades, but scientific evidence supporting use is limited to small, poorly designed studies. Human research began in the 1930s, but was largely abandoned due to serious gastrointestinal and heart toxicity. It should be noted that the drug digoxin may improve symptoms of congestive heart failure, but does not improve mortality (length of life).